Diana is a dining institution in Bologna. 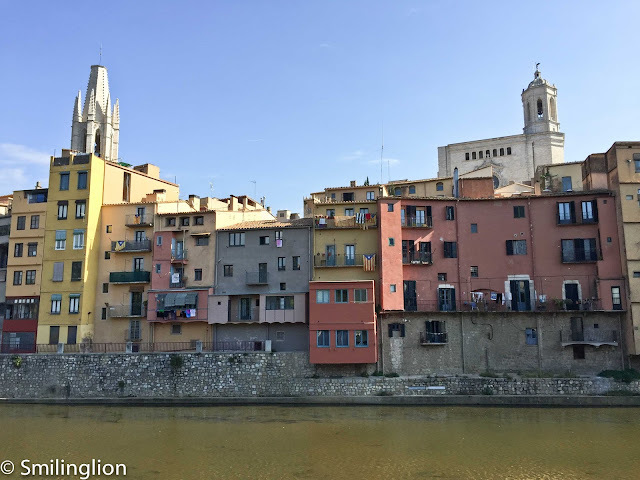 Located in the centre of town, it is along the main street of Via Independenza and a few minutes walk from Piazza Maggiore. Reservations are advisable here as it is often fully booked, being very popular with the locals. We went there for two consecutive lunches (Saturday and Sunday) because the food was very good and also because it was right next to our hotel. Bologna does not seem to see many Asian tourists, and the waiters were quite bemused to see us eat at their restaurant so often within so short a time. 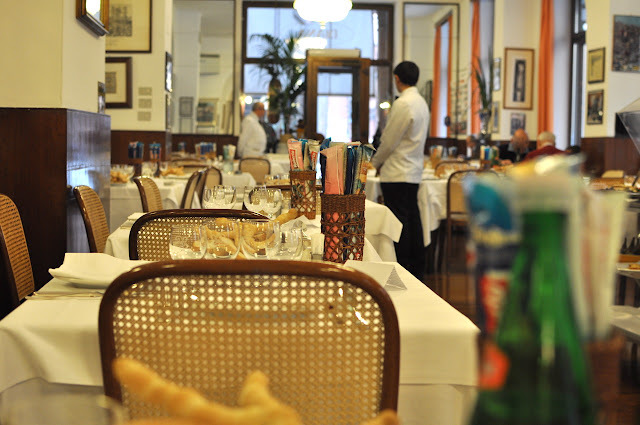 The restaurant is a casual trattoria with quite a simple menu, but with smartly dressed waiters in their white jackets and curt service. 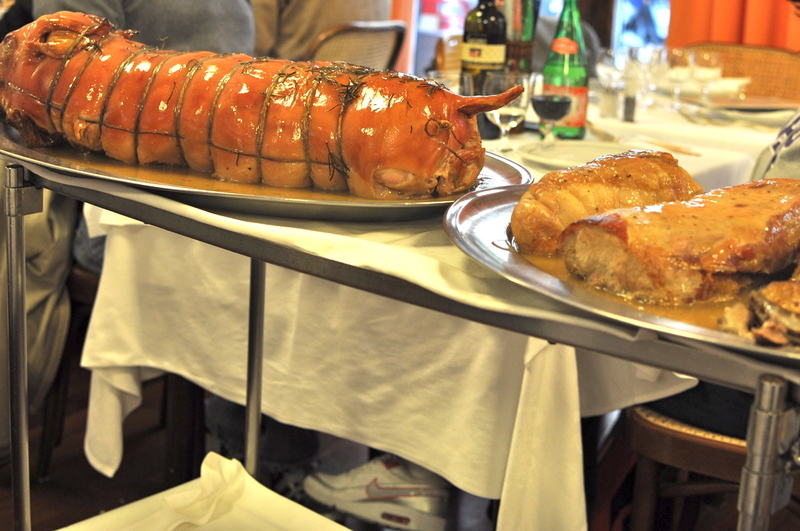 During our two meals there, we had some wonderful trattoria food, especially some of the Bologna favourites. 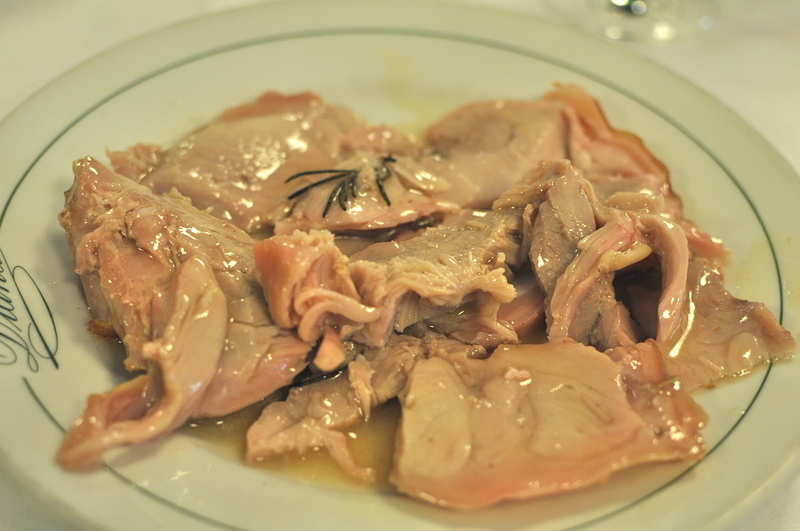 The parma ham was very good, which was not unexpected given that Bologna (being the capital of Emilia-Romagna in which Parma is a city) is known as the food capital of Italy. 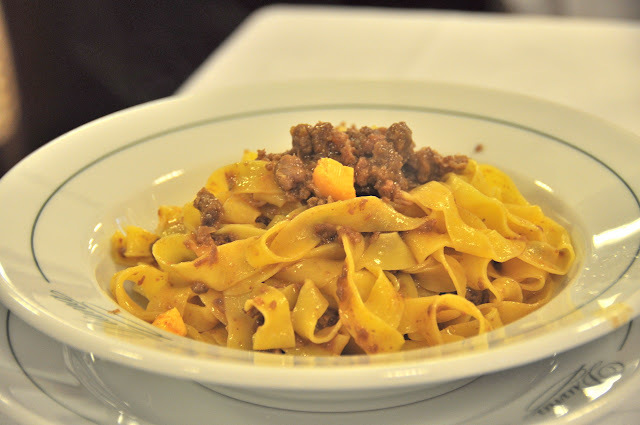 Being in Bologna, it also made sense to order the tagliatelle bolognese. All these were washed down with a cheap but cheerful bottle of Diana-labeled house wine from the region. The local favourite was the tortellini con brodo (i.e. pasta dumplings with broth). Think chinese 'xiao long bao' but with the soup on the outside. All the locals dining at the restaurant were having it and we had to try it as well. The restaurant cooks it in a large metal pot which the waiter brings out and scoops the pasta and broth on your plate in front of you. It was comfort food Italian-style. 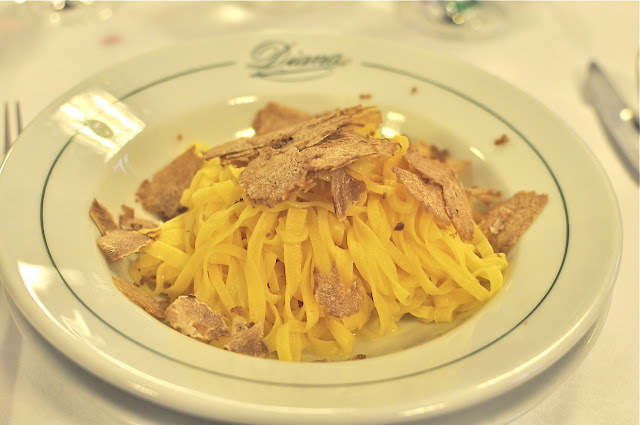 We then could not resist spoiling ourselves with the tajarin cooked in butter and with white truffles. This is a classic North Italian dish at this time of the year (white truffle season), and once again, the pasta was cooked in a metal pan, which was taken out by the waiter and the pasta served to us at our table, followed by a generous shaving of white truffles. At this time (this was during Sunday lunch), we were intrigued when the waiter pushed out a trolley of meats. There were two trays, the roast suckling pig trolley and the tripe trolley (which had a large pot containing pigs' innards in steaming hot broth). We couldn't get our eyes off the suckling pig and was trying to catch the attention of the waiter. Finally, he noticed our frantic wavings and came by to slice a plate of succulent pork for us. It was heavenly. 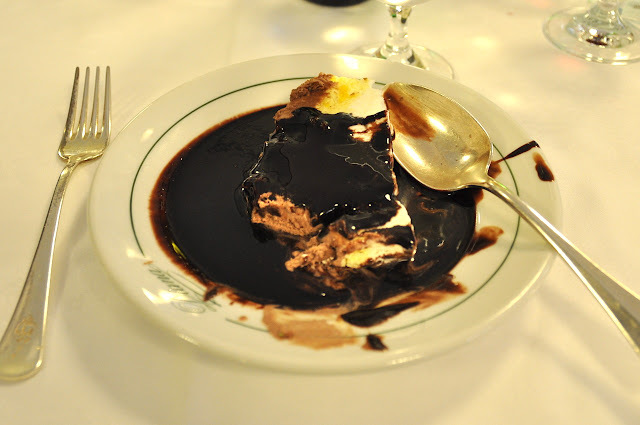 Lunch was completed with a simple semifreddo for dessert and some espresso. 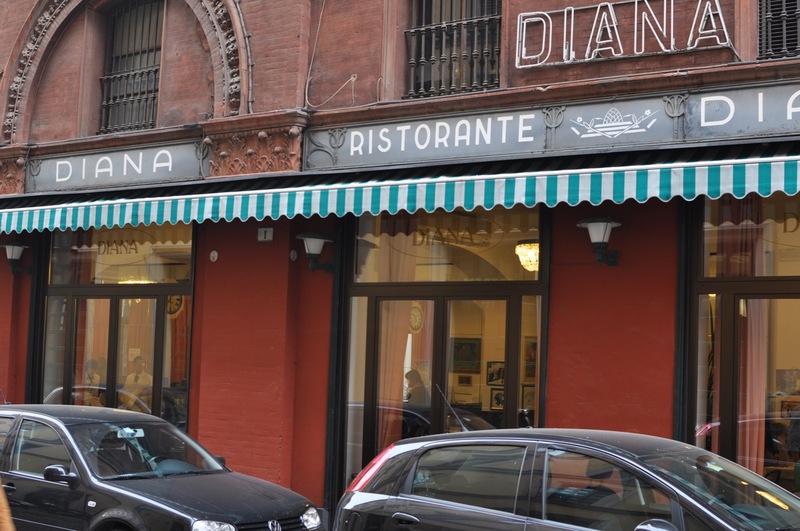 Food: Traditional Bologna cuisine at its best. They love their pork in this city. Ambience: Tables are cramped, but the place is bright and airy. 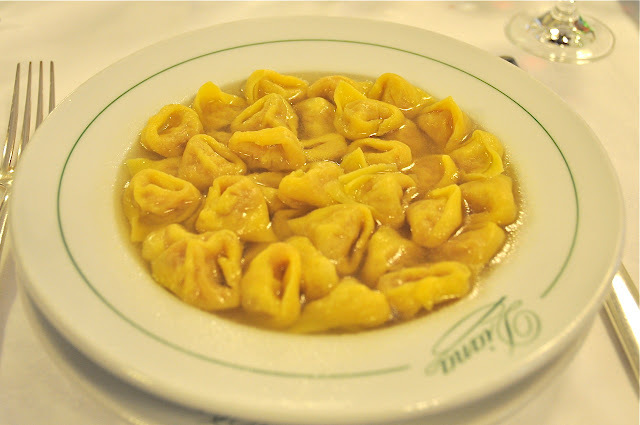 A good place to people-watch as locals come and go quite quickly once they've had their fix of the tortellini con brodo. 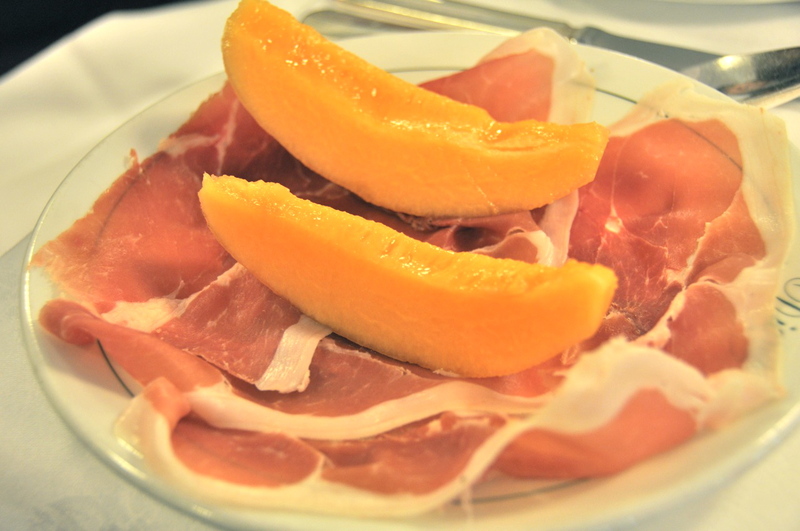 I really liked that bolognaise and prosciutto with melon & fig. Wish I got to try that pig!